The John William Pope Center’s Jay Schalin recently published a report detailing the decline of America’s college English departments. More and more, traditional English literature classes and other similar icons of the English language in academia are disappearing. Many of them are replaced, or supplemented by, “digital humanities,” “media studies” and the like. 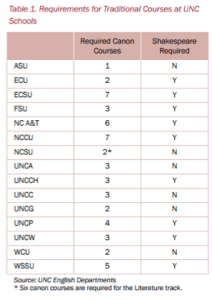 Schalin used the University of North Carolina at Chapel Hill as an example, where requirements have vastly changed between 1988 and 2014. 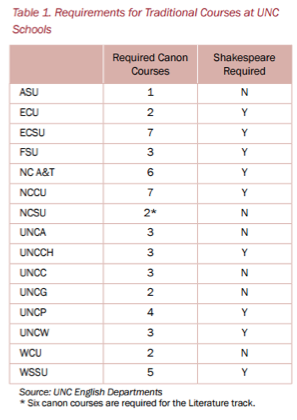 Four specific literature courses were mandatory prior to graduation, ranging from studying T.S. Eliot to Chaucer to William Shakespeare in the 1988-89 school year. 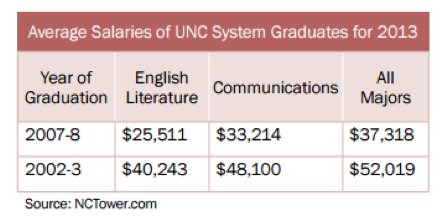 But, by 2014-15, only one literature course is mandatory at UNC, either a literature course from Chaucer to Pope or one specifically about Shakespeare. English departments are struggling across the board, so much so that NCCU combined their English department with foreign language departments. However, English departments still exert some power as many of them control their university’s writing courses.